When Stevie’s social worker tells Cathy, an experienced foster carer, that Stevie is gender fluid she isn’t sure what that term means and looks it up on the internet. Stevie, together with his younger brother and sister, have been brought up by their grandparents as their mother is in prison. But the grandparents can no longer cope with Stevie’s behaviour so they are placing him in care voluntarily. He goes to live with Cathy and her family. Like many young people Stevie spends time online and Cathy warns him about the dangers of talking to strangers, and how to stay safe online. When Stevie’s younger siblings tell their grandmother that they had a secret they can’t tell Cathy is worried. However, nothing could have prepared her for the truth when Stevie finally breaks down and confesses what he’s done. "Cathy Glass has done it again. Another beautiful book." "Cathy Glass amazes me more each time I read one of her books. " "She is such a good author and you really feel part of the story." "A brilliant book from a brilliant author. " "I love that Cathy can touch on any taboo subject…"
"Cathy always writes with love and energy..."
"All I can say is WOW! Such a good book! As always, Cathy writes with warmth & sensitivity about a difficult topic for many ." "Another fantastic book …. beautifully told experience..."
"A dark and poignant true story…"
"Wow – this book knocked me for six. " "A perfect blend of twists and turns. " "After reading the book, I stood up on my bed and clapped for Cathy for a minute. " 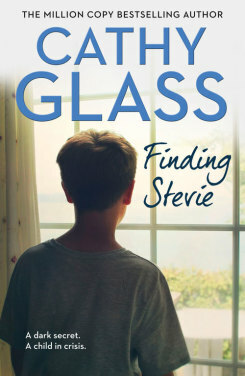 Congratulations to Cathy Glass whose memoir Finding Stevie remains in the top ten at no 9. Congratulations to Cathy Glass whose memoir Finding Stevie is Number 5 in the Sunday Times non fiction paperback bestsellers. Congratulations to Cathy Glass whose new memoir Finding Stevie has charted at number 5 on the Sunday Times paperback Bestsellers list in its first part week.